"All the news that fits, we print"
The Appleknocker is the Rotary Club of Sebastopol's weekly Bulletin. 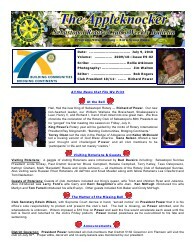 This publication is distributed to Rotary Club members via email, and contains lively articles covering the week's meetings. Bright graphics, color photos and an easy-to-read layout are featured in each Appleknocker. Club members participate in the editing and photography needed to produce each issue. Club news, Member updates and events fill each issue. In addition, the current and future meeting programs are recorded. This content and a lot more can be found in each issue. Contact Tom Boag at trboag@aol.com for more information about the Appleknocker.